It is whispered that centuries ago Indians ventured from central and eastern Uttar Pradesh to what is come to be renowned today as the magnificent, Fiji Islands. These obliged voyagers, gambling with survival, sailed across the Marines for six months. Throughout this journey, men and women united in holy matrimony and started families in great hopes of being ‘indentured laborers’ on sugar plantations. Sadly, odds played against the destiny of these survivors, as women involuntarily tied the knot to two to three men and men were taken in as ‘indentured laborers’ (a fancy term for slavery since it was abolished at this time) in the city of Navoua. Men earned a salary of 10 cents per year for the original sugar cane enterprise, The Vancouver Company, and women governed the household(s)—these survivors were our Fijian ancestors. It is certain to say that most Fijians shared the four corners of their childhood walls with peculiar yet fascinating Polynesian art. As infants, we were immediately immersed in households consisting of the following: insanely terrifying tribal masks, hand-painted wooden banana trees—that required some mastery assembly—and unconventional, colored, curvier dolls with two outfit options (a dress made of tribal tapa fabric and the memorable coconut bra paired with a straw skirt). 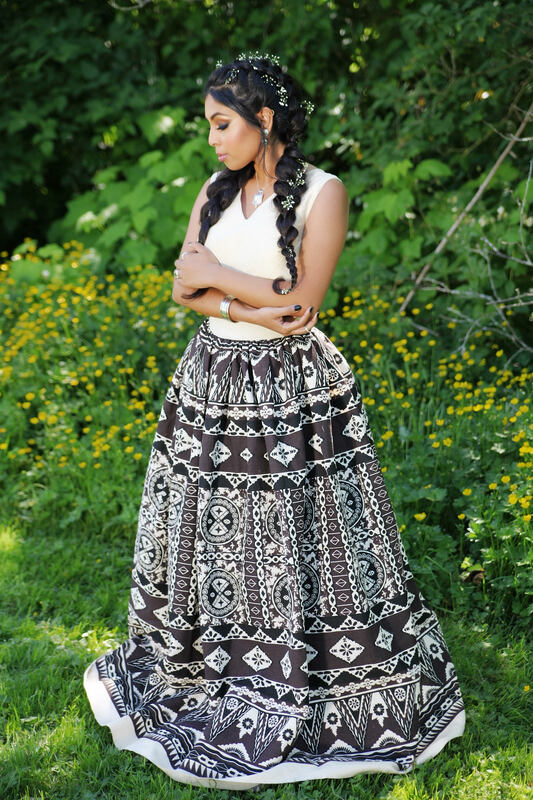 Sheetal Naicker, the brains and design strategist behind this passion project, always admired the traditionally flaunted Indian art form attained from eccentric glamour, Bollywood media, and timeless history. However, she never understood nor appreciated the art of her Fijian heritage until she pursued a post-secondary program in jewelry art and design. Genuinely mesmerized by the depths of history, glamour, and art from both backgrounds, she visualized a concept that amalgamated the pioneering heritages and platformed the art of commingling society. Incorporating core inspiration inspired by shapes and line formation she cast, molded and handcrafted sterling silver pieces with exquisite finishes, clean hammering techniques, and meticulous classic patterns. 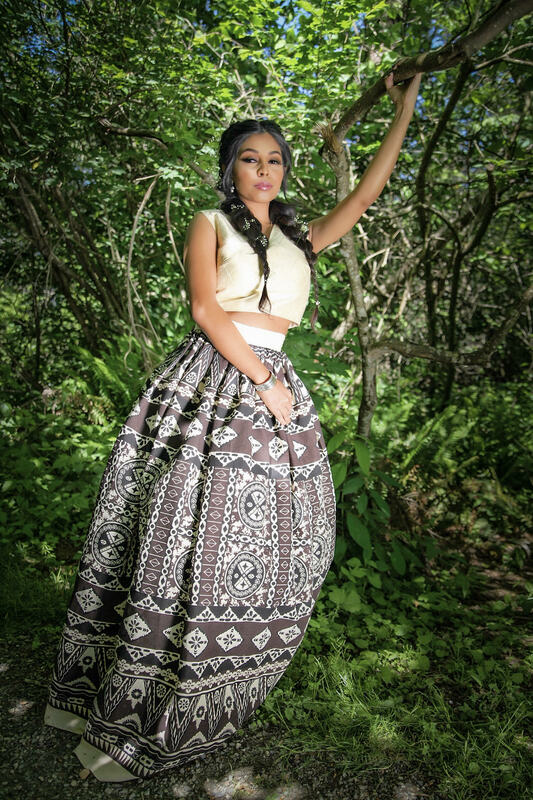 It is a fresh, modern interpretation of a traditional Fijian tribal bride—the voluminous maxi skirt wholeheartedly designed of tapa fabric (beaten bark of the paper mulberry tree which is adorned with exotic and earthy hues, native plant dyes, and charcoal) is balanced with a contemporary blouse and stunning fine jewelry. 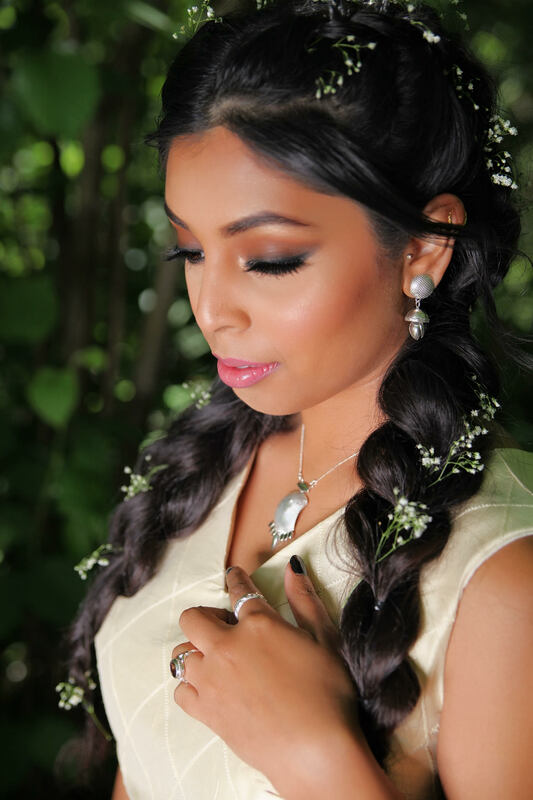 Eloquently enhanced with a timeless smoky eye and double-dutch braids polished with baby’s breaths, these elements were key for triumphing a diversified historic tribal bride look. The true style splendor of this creative composition is the blatantly stated, universal representation of the new generation Indian brides. In our time, brides are becoming less prone to over-the-top glamorizing and the ideology of wearing accessories and a bridal ensemble for just one single day. Simple realizations such as how great of a significance vintage holds, supporting up and coming local designers with a minimalistic aesthetic, being true to who you are versus what the family desires, and incorporating timeless staple separates are surely some of the things brides are considering today. 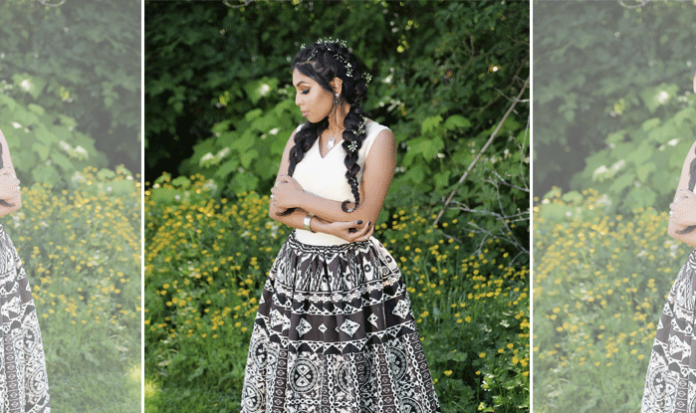 Why not take the inspiration from this tribal bride? Because sometimes, perhaps the best way to truly make a statement is taking it back to where it all began–your real historic routes, the jolts, and highlights of your childhood and by simply wearing a one-of-a-kind custom outfit that has been dismissed in far history.